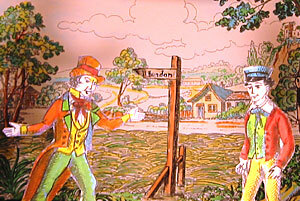 The above picture is from Peter & Sylvia Peasgood's 2007 production of Redington's Oliver Twist, first published for the Toy Theatre circa 1860 from the earlier George Almar dramatisation which had enjoyed long-running success at several London Theatres including The Lyceum, The Surrey (demolished 1934) and The Royal Coburg (Old Vic). The Lyceum was known for staging Dickens adaptations and the Surrey and Coburg were notorious for their blood-and-thunder sensational melodramas. Almar's script fitted both categories very well. Charles Dickens' story of Oliver Twist was first serialised in monthly instalments in "Bentley's Miscellany" from 1837 to 1839. George Almar's dramatisation appeared on stage with great haste, almost before the final instalment was published. Dickens is reported to have been less than impressed with the play. 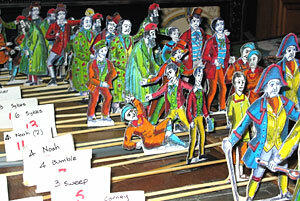 The Toy Theatre version of Oliver Twist has 75 characters (counting duplicates in different attitudes) and 26 scene-changes (15 actual sets; some of which appear more than once). In order to move from scene to scene more effectively, Peter Peasgood's production dispenses with the wing-pieces and uses only the back cloths, inset into a black, composite set. Peter also moved an opening scene to later in the play, as it gave much of the plot away too early in the drama. The now-famous "Please sir, I want some more" scene had to be written in, as it was not included in the original dramatisation. 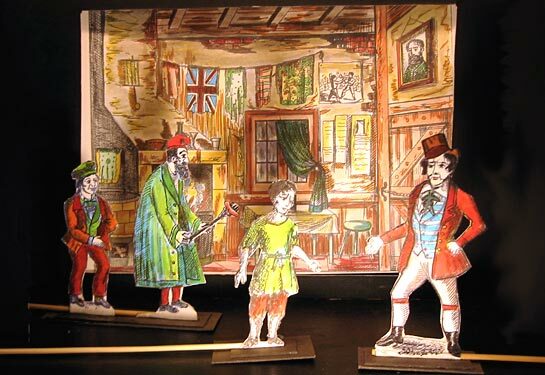 Additionally, the final dramatic scene where Bill Sikes falls from the rooftops was done off-stage in the original Toy Theatre play, so Peter designed two elaborate new set-pieces showing Sikes first climbing across the rooftops and then plummeting to his death in full view.